Warner Bros. has released the first official synopsis for Meg, the studio's upcoming thriller that takes the shark movie genre to new lengths, quite literally. The last we heard about this movie was way back in January, when Steve Alten, who wrote the book that Meg is based on, stated that this will be an "edge-of-your-seat scary movie" that features a massive 70-foot shark, but this new plot synopsis straight from Warner Bros. states that the shark is even bigger, coming in at a whopping 75 feet long. Take a look at the official synopsis below. "A deep-sea submersible, part of an international undersea observation program, has been attacked by a massive creature, previously thought to be extinct, and now lies disabled at the bottom of the deepest trench in the Pacific... with its crew trapped inside. With time running out, expert deep sea rescue diver Jonas Taylor (Statham) is recruited by a visionary Chinese oceanographer (Winston Chao), against the wishes of his daughter Suyin (Li Bingbing), to save the crew, and the ocean itself, from this unstoppable threat: a prehistoric 75-foot-long shark known as the Megalodon. What no one could have imagined is that, years before, Taylor had encountered this same terrifying creature. Now, teamed with Suyin, he must confront his fears and risk his own life to save everyone trapped below... bringing him face to face once more with the greatest and largest predator of all time." This project has been in development for quite some time, with the movie once going forward way back in 2006, when New Line Cinema picked up the rights, with Jan De Bont (Speed) attached to direct, but it never got off the ground and the rights eventually reverted back to Steve Alten. There was talk that the movie may move forward in 2008, with a new script by Shane Salerno (Avatar sequels), but nothing significant happened with the project until 2015, when Dean Georgias (The Manchurian Candidate) came aboard with a new script. A few weeks later, Eli Roth was set to direct Meg, but he ultimately dropped out, with Jon Turteltaub (National Treasure) taking the helm. 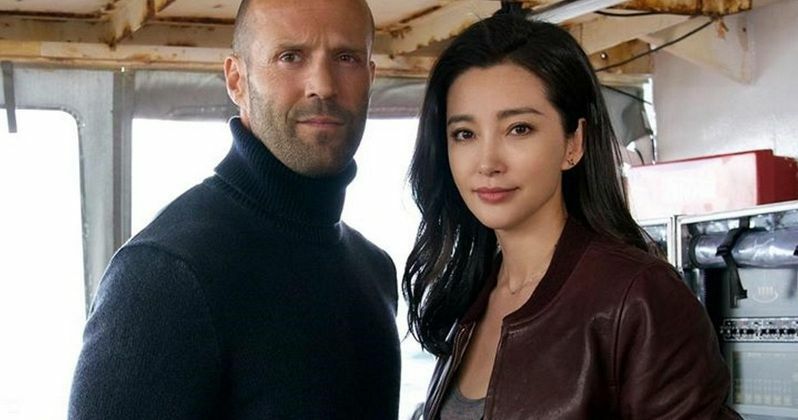 The first-look photo was released back in October, offering our first look at stars Jason Statham and Li Bingbing. The talented supporting cast also includes Ruby Rose, Rainn Wilson, Robert Taylor, Cliff Curtis, Olafur Darri Olafsson, Robert Taylor and Masi Oka. With the official synopsis now being released, it could be an indication that the studio is getting ready to launch the first trailer. Still, there is no indication that is happening anytime soon, especially since the release date was recently pushed from Spring 2018 to late Summer 2018. Warner Bros. had originally set a March 2, 2018 date for Meg, but this shark movie was later pushed to August 10, 2018. It's a good thing the movie was pushed too, because that weekend is now rather crowded, with Warner Bros.' moving Game Night in to take Meg's place, which will be competing against 20th Century Fox's Red Sparrow starring Jennifer Lawrence, Annapurna Pictures' Death Wish remake starring Bruce Willis and Sony's action-thriller Alpha starring Kodi Smit-McPhee. Now on August 10, 2018, Meg will face Universal's Scarface remake. Jon Turtletaub directs from a script that was worked on by a number of other writers, including Belle Avery (Malevolence), the sibling writing team of Jon Hoeber and Erich Hoeber (Red) and James Vanderbilt (White House Down). Hopefully Warner Bros. will reveal more about Meg in the near future.